Contemporary Art from Cuba: Irony and Survival on the Utopian Island is a traveling exhibition organized two years ago by Arizona State Universty, and curated by museum director/curator Marilyn Zeitlan. Arizona State University hosted the premier opening of the exhibition in 1998 to coincide with Cuba's 1898 independence from Spain. The exhibition features paintings, sculptures, and installations by 17 Cuban artists, from the ages of 24 to 39, who remain in Cuba to pursue their art careers and has traveled the United States for two years. The artists in this exhibition are all too young to have taken part in the initial struggle of the Cuban Revolution of 1959. Their art created between 1994 and1997 offers the viewer multiple views of Cuba’s complex colonial past and its cultural heritage as a crossroads for Africa, Latin America, Europe, and Asia. Many of the works allude to Cuba’s ambivilant relationship with the United States, and the current political, economic, and social changes.facing the younger Cuban generation today. Exhibition curator Marilyn Zeitlin comments, "Cuba's isolation has produced an artistic output that is fresh, independent and relevant to the core issues of living." Three major themes resound throughout the exhibition; Isolation or the special condition of being an island;Inventiveness or inventado used to survive in a place where shortages are prevalent; and History or the rhetoric of history. Selected works reference living on an island in the middle of the sea, the use of boats or rafts, and the tragedy of the balseros (islanders who departed from the island on makeshift rafts). Island references symbolize the separation created initially by geography and then augmented by politics and economic embargos. Inventando, refers to the Cuban’s inventive methods to recycle and rebuild daily goods, household and mechanical items due to constant shortages of daily needs. The artists embue symbolic meaning to old materials, discarded objects and equipment parts. The rhetoric of history, contrasts the differences between the promises and realities of the social and political systems offered by Cuba’s revolutionary principals in contrast to the 1990s influence of United States currency and capital market opportunities. All the artists attempt to peel back the stories of Cuba’s turmultous political history and cultural influences of diversity. 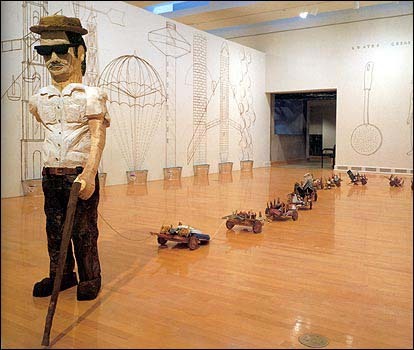 In general the political slant of Cuban art in the 1990s has changed. Artists today are less prone to preaching and admonishing. This present generation of artists tend to make art about politics rather than political art.